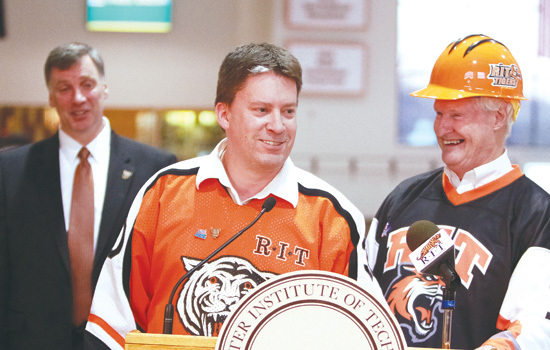 Alumnus Stephen Schultz ’89, center, reminisced about his days leading the Corner Crew at the Nov. 12 announcement of the Tiger Power Play campaign for RIT hockey. Schultz and his wife, Vicki, pledged $1 million to the campaign. Here, Schultz is flanked by RIT President Bill Destler, right, and hockey coach Wayne Wilson, left. While navigating the demands associated with studies in computer science, Stephen Schultz ’89 took advantage of numerous outlets on campus to maximize his college experience. But for the co-founder and chief technical officer at Pictometry International Corp., nothing rivaled his passion for Tigers hockey. 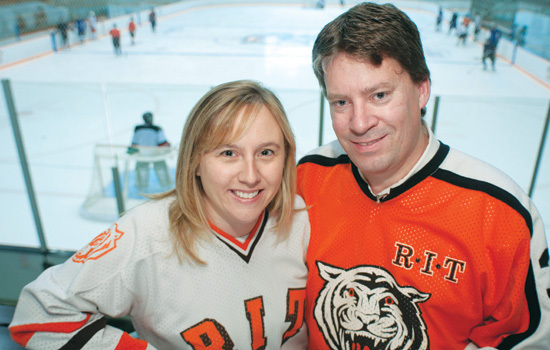 Joined by his wife, Vicki Schultz ’94, ’99 (business administration, MBA), the alumnus presented an opening gift to Tiger Power Play—The Campaign for RIT Hockey, which kicked off last month during a special presentation inside Frank Ritter Arena. The gift featured $1 million in Pictometry stock that he earned through co-founding the company. The campaign goal is $15 million and targets alumni and other supporters of RIT men’s and women’s hockey. It’s expected a new arena—designed to accommodate 4,000 to 6,000 fans—will cost $25 million to $30 million to build. RIT plans to cover the remaining cost, but when and where construction will take place has not yet been determined. Schultz says his affiliation with RIT hockey dates back to 1982. As a regular at home games, he would later become co-founder of the Corner Crew. Additionally, during his time as an RIT student, he served as editor in chief of Reporter magazine and was a member of both Computer Science House and Student Government. Having witnessed firsthand the school spirit generated by the Tigers’ NCAA Frozen Four appearance, Schultz appreciates the impact a newer, larger arena will have in engaging a broader spectrum of the campus community.